Properties: Easily removes all kinds of kitchen and bathroom dirt. 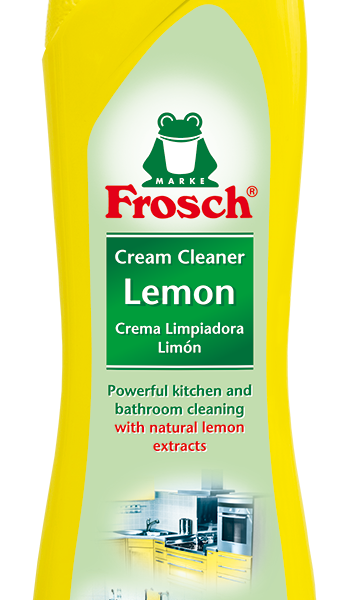 The formula with natural, micro fine marble flour and natural lemon extract provides a powerful cleaning, which spreads a pleasant lemon odour. Ideally suited for ceramic, enamel, stainless steel and glass surfaces as well as electro and glass ceramic cooking surfaces. Application: Apply undiluted to the dirty surface, scrub with a wet cloth or soft sponge. Do not use a hard or scratchy scouring sponge. Rinse thoroughly. Do not mix with other products. Not suited for acrylic surfaces. Ingredients: <5% non-iconic surfactants, preservative (phenoxyethanol), perfumes. Further ingredients: Marble flour, lemon extract.